On a late October Saturday my backyard was a sight to behold. House sparrows swarmed the feeders as usual, but down below, on the grass, were 10 white-throated sparrows. There is nothing uncommon about white-throated sparrows, especially during fall migration. But I was happy to see my feeding efforts rewarded by a flock of “true sparrows.” House sparrows, after all, are imposters. Look in your field guide and you won’t find them in the sparrow section. What you will see on those pages is lots of brownish birds sporting streaks, chest spots or crown stripes. Sometimes all three! You’ll also see juncos and towhees, fellow members of the sparrow family that look nothing like their cryptically decorated cousins. Appreciating the variety and subtle beauty of sparrows is the mark of a true birder. We reach a point when we no longer think of sparrows as “little brown jobs” or LBJs. Instead, we want to attract them, observe them and identify them. And we make special trips to find the obscure ones. 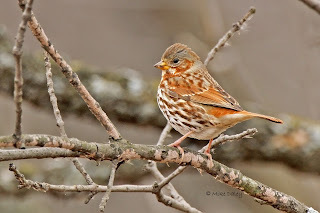 I recently went to Fermilab in Batavia to search for my first Le Conte’s sparrow. Some birding friends on the Cantigny Park walk the day before convinced me to try, telling me exactly where to look. A Le Conte’s sparrow, unlike about half of the 20 sparrows that live in or visit DuPage, will likely never appear in your backyard. It’s a shy species that prefers the dense cover of wet grasses and sedge, usually near water. Upon arriving at Fermi through the east entrance I noticed a small band of birders standing out in the scrubby wetlands adjacent to the “A.E. Sea.” I caught up and learned it was a Morton Arboretum class led by Denis Kania, one of this area’s top field ornithologists. They’d already enjoyed killer looks at Nelson’s and Le Conte’s sparrows, so I was definitely in the right place. I thanked Denis for the assist as the class moved on to bird other parts of Fermi. During the next hour I locked in on even better views of two or more Le Conte’s – a truly handsome sparrow and also our smallest. Wet feet and bur-covered clothing were a small price for some quality time with a bird I’d waited years to see. Patience goes a long way when tracking down a Le Conte’s sparrow. You wait for one to fly and then mark the point where it dives into the weeds. Then you approach slowly, watch for movement and hope for a clear view of at least a piece of the bird. Occasionally a Le Conte’s will sit up in the open. Birders and photographers dream of such moments. The tiny Le Conte’s visits here only on migration. Ditto the Nelson’s, an equally bashful sparrow that I missed at Fermi but saw once before at Springbrook Prairie in Naperville. It too is a beautiful bird, with fine and colorful markings. To find and observe these under-the-radar sparrows, as well as grassland specialties such as Henslow’s, grasshopper and savannah sparrows, I recommend joining a field trip. 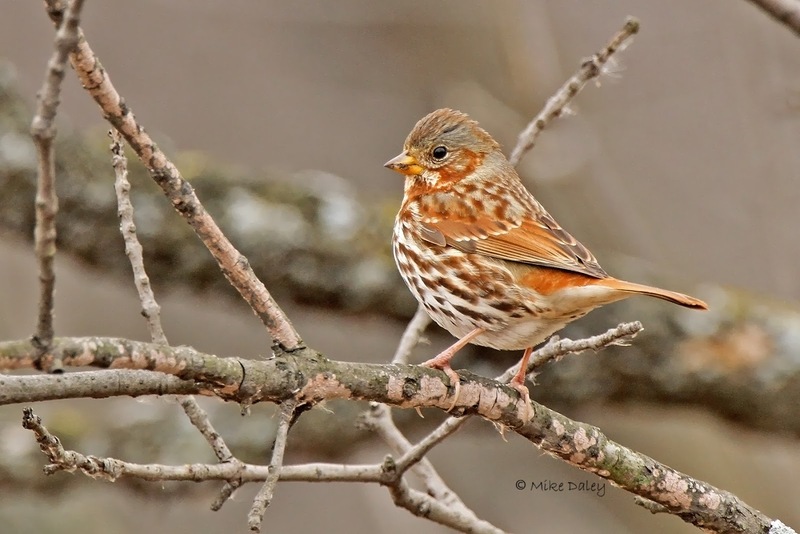 The DuPage Birding Club stages regular visits to well-known sparrow havens like Fermi and Springbrook. Fellow birders with local site knowledge and “sparrow smarts” can help you avoid a potentially frustrating search. Meanwhile, a good number of sparrow species can be seen from your kitchen window. My own yard list so far includes 10 varieties, including one-time visits by Eastern towhee and field sparrow. Lincoln’s sparrow has appeared twice, but not since 2005. Others are fairly regular, depending on the season: white-throated, white-crowned, fox, chipping and song. This time year, if you have feeders, dark-eyed juncos are common and watch for American tree sparrows, too. Both are northern breeders that come here for their winter vacations. All of these backyard sparrows spend most of their feeding time on the open ground, making them easy to watch. I especially enjoy the “jump and scratch” foraging method of the fox sparrow, a colorful fall migrant that sometimes stays all winter. At home or in the field, sparrows are worth a closer look. And with this family, every season offers new viewing opportunities.